Scribblenaut-ized Heavy, Spy, and Pyro by Turk128. 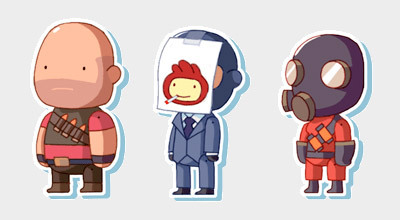 As with the previously featured fan-drawn game characters mimicking Scribblenauts’ playful style, these Team Fortress 2 classes likely won’t appear in the DS game. Neither will these survivors from Left 4 Dead. via Scribblenaut-ized Heavy, Spy, and Pyro by Turk128…. – Tiny Cartridge – Nintendo DS & DSi News, Media, Videos, Imports, Homebrew, & Retro Junk.